When I was in Guatemala in December I had the extraordinary privilege of living with one of the best cooks in Xela, or anywhere, Dona Yoly. She was our host mom during our second week there, which, lucky for us, fell on Christmas. When I asked if I could help her make the Christmas tamales, she agreed. 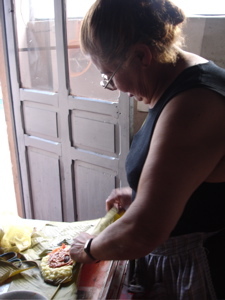 On Christmas Eve, after our morning Spanish studies, I happily skipped the school field trip to Zunil for the chance to make tamales. Here is one ready to roll. 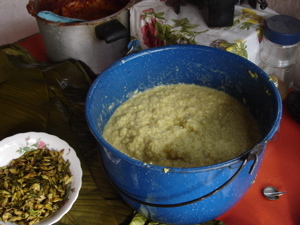 Most of the Guatemalan tamales I saw are based on this same type of red sauce (chilies, tomatoes, pumpkin seeds, sesame seeds, onions, garlic, all toasted and blended and then put in a big pot with many different types and parts of meats (chicken feet, pork skin, and beef parts, bones and all). Others I saw also include a prune and olives. 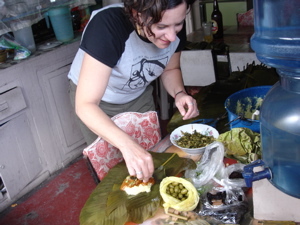 Yoly's tamales are the only ones I ate that included loroco flowers and peas. They are all rolled in banana leaves. Here's Dona Yoly showing me how she does it. Here's me taking a stab at it. I was told I was a "bandito" or fast learner. She left me alone after awhile and let me do them all–fueled by a little Gallo beer of course. Here's the masa mixture and the loroco flowers. 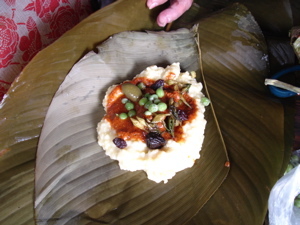 The masa is much moister and more like a porridge than I've found in Mexican tamales. 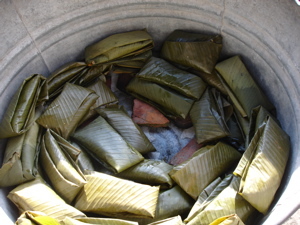 It is a mixture of corn and rice cooked for a long long time. I wish I'd witnessed that part of the preparation but I was in school. I plan to research this. 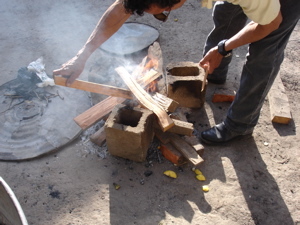 This is Yoly's stepson, Walter, building the outdoor fire for cooking the tamales. Here they are, ready to cook in the galvanized bucket. They are laid on top of small bits of broken bricks and scraps of wet banana leaves to prevent burning. They cook for about an hour. The Christmas Eve meal is tamales with slices of white Bimbo bread–traditionally eaten at midnight as fireworks go off all over the city. This entry was posted in Latin American, holidays. Bookmark the permalink. Post a comment or leave a trackback: Trackback URL.